While I am not on a low carb diet, I know many of you are, and I know how hard it must be to stick within your daily carb limit. 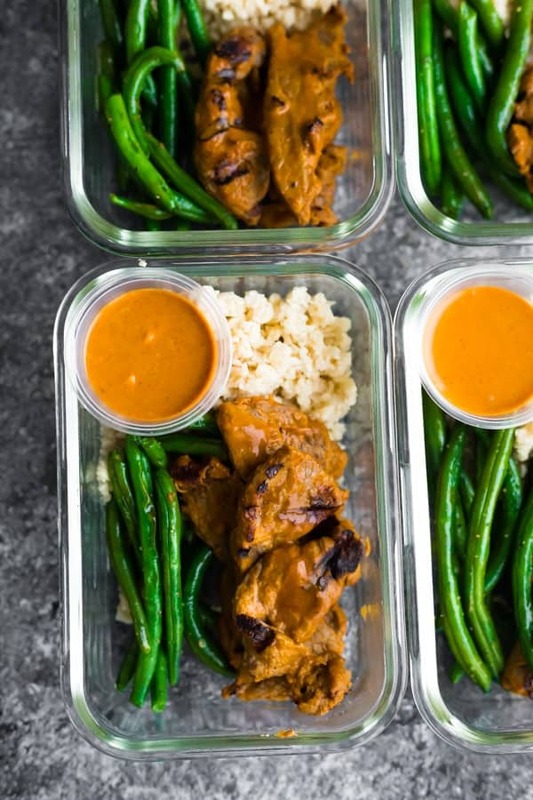 You guys have been loving this Low Carb Cheesy Chicken & Rice, and today I’m sharing another delicious low carb option for you: this satay beef meal prep! 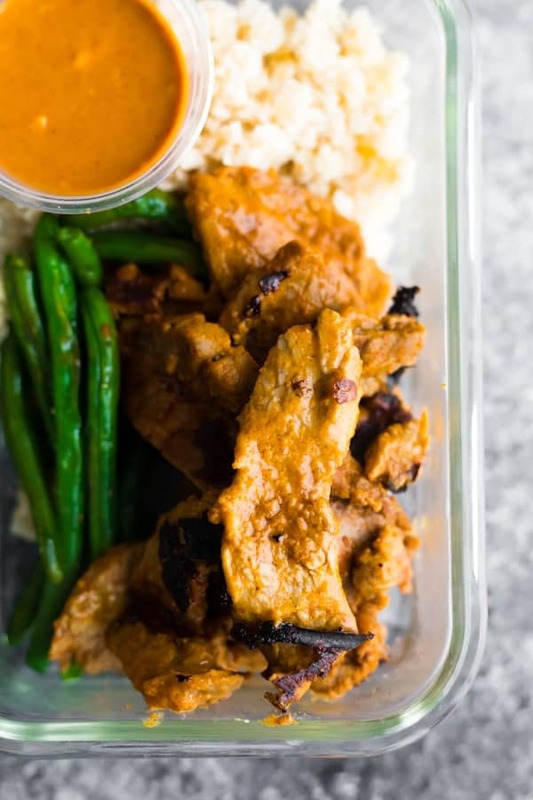 The satay beef alone has just 2 g net carbs, but served with cauliflower rice and green beans, this delicious low carb lunch option clocks in at just 6 g net carbs. Hallelujah!
. And portion out with the leftover sauce, some cauliflower rice and some steamed or sauteed green beans. Tada! Can I make this with chicken? Absolutely! I would recommend boneless skinless chicken thighs as they are easy to grill (and not overcook), but you could use chicken breasts as well. Can I add some extra flavor to the cauliflower rice? You sure could, although I found the low carb satay sauce added so much flavor to the cauliflower rice. Here’s a post with 7 Cauliflower Rice Recipes! 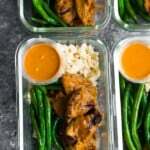 How long do these low carb meal prep bowls last for? These are safe to store in the fridge for up to 4 days. I haven’t tried freezing them and worry that they cauliflower rice would get mushy. You could freeze the beef in the marinade, and you could *probably* also freeze the cooked beef & sauce, but I have not tested. What if I want a spicy beef satay? I’d recommend adding some red pepper flakes or low carb hot sauce. …they’re not as good as my favorite 2-cup capacity storage containers but they did the trick. Shake together the coconut milk, peanut butter, lime juice, soy sauce, monk fruit sweetener, red curry paste and ground ginger. 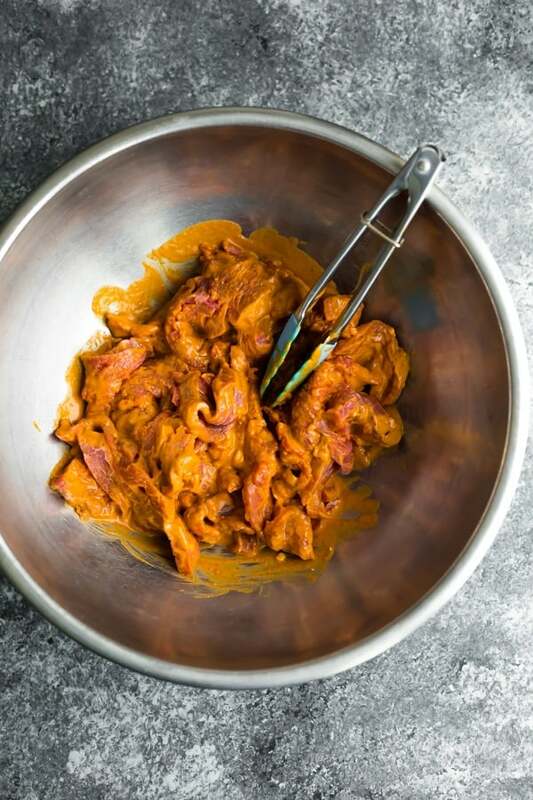 In a large bowl, stir up the sliced flank steak with half of the coconut sauce. Portion the remaining half of the sauce out into small storage containers. Allow beef to marinate for 30 minutes. While beef is marinating, prepare the cauliflower rice and green beans. Cauliflower rice- heat oil over medium heat in a non-stick skillet. Add the riced cauliflower, season with salt & pepper, and cook for 5 minutes, or until cooked to your liking. 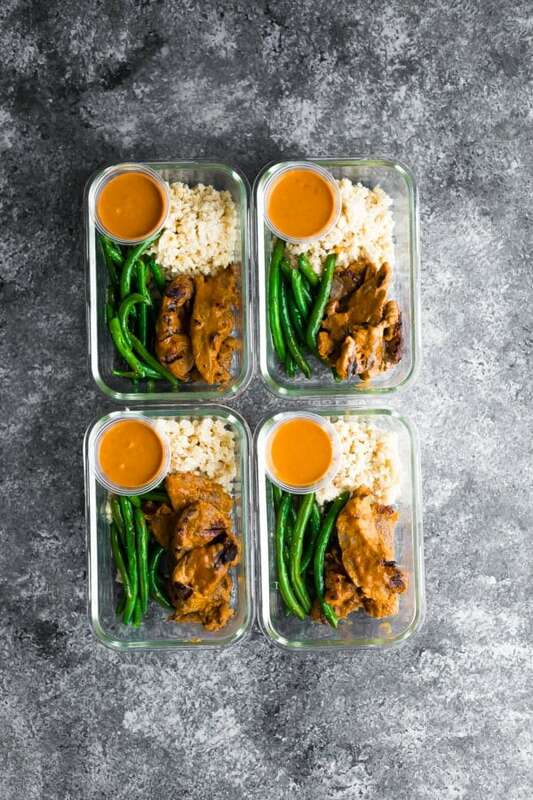 Divide up between four 3 cup meal prep containers. Green beans- Add another tablespoon of oil to the pan and cook the green beans for 5 minutes, until bright green and slightly softened. Divide amongst the meal prep containers. Heat an indoor grill. Working in batches, cook the strips of beef for 2-3 minutes, until cooked through. You can also cook on an outdoor grill and may wish to use a grilling plate or skewer the beef. Divide beef out between the meal prep containers. 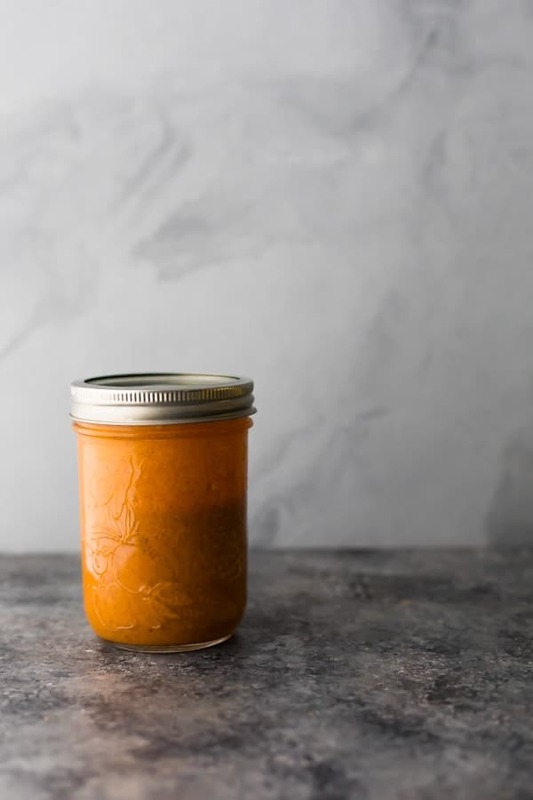 Cool completely, then seal and store in the fridge for up to 4 days. Remove the sauce, then reheat in the microwave until steaming hot. Spoon the sauce over the beef and veggies, and enjoy! * I used granulated monk fruit sweetener, if you are using powdered or liquid, start with 1/2 and taste. You can also swap for 1 tablespoon brown sugar or maple syrup if you are not low carb. Hi Rachel! Hmm. I’m not 100% on this. I have not tried a dairy-based cream, it may work? Or maybe a cashew cream? Let me know if you try either of them! Where can I buy monk fruit sweetner? Hi Kathy! I ordered mine from Amazon (this one: https://amzn.to/2H32XxS). If you are not low carb you can swap for brown sugar or maple syrup/honey! Does this recipe have nutritional facts to go with it? Thanks! Yes! Some how they didn’t get entered into the recipe card. Just updated! Which brand of Monk fruit sweetener do you like to use?